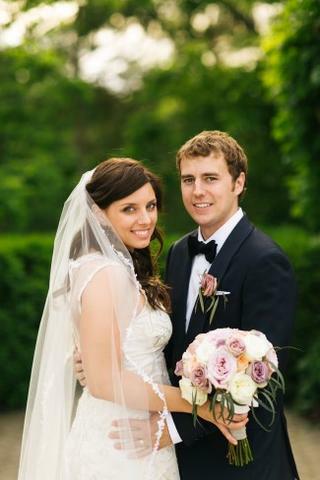 Today we are featuring the beautiful real wedding of a ClassicVeils.com customer – Kelly and her husband Chaz. Congrats to you both! 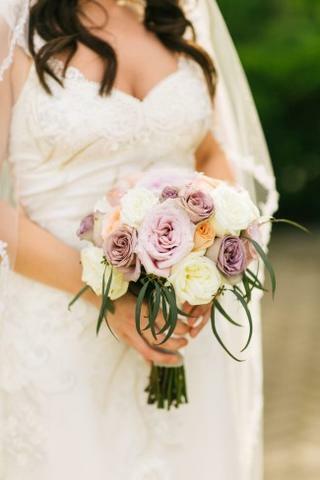 Captured by Lang Thomas Photography from Cincinnati, Ohio. 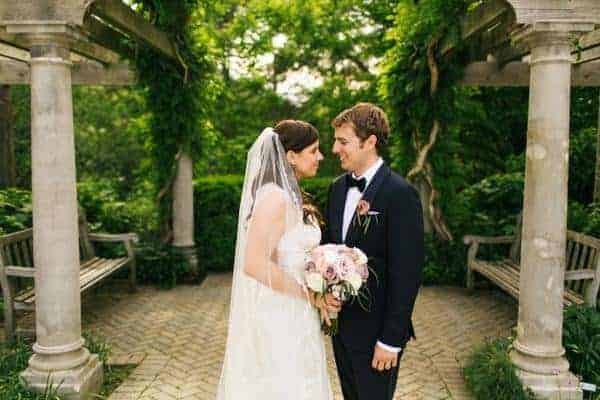 Kelly chose to wear a 90″ chapel length veil with a circular cut, accented with the delicate edge of lace number #6 that went around the entire edge of the veil. 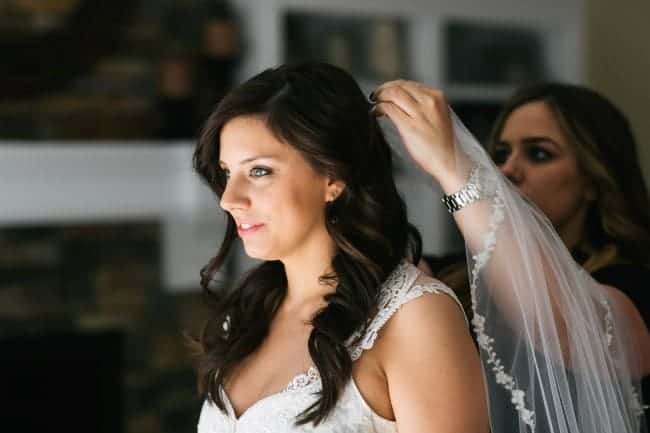 Our bride designed the veil herself using our Custom Wedding Veil service, and she should be so proud of her design because she looked absolutely smashing! Her luscious brown locks were loosely pulled back into a half up/half down do, with wavy loose curls and the veil placed on the crown of her head. Is this a Mantilla veil? Although the veil Kelly wore is similar to a mantilla in that the lace goes all the away around the edge, it actually is not a mantilla. If it was a mantilla the lace would have sat flat on Kelly’s head, hiding the comb and framing the face. For Kelly’s veil style, however, the lace gathers at the comb and should be worn near the crown of the head. 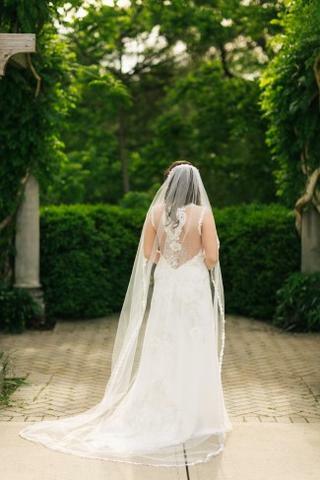 Take a look at how well the lace of the veil worked perfectly with the gown. If you notice, the illusion straps in the back of the gown are a similar match to the lace detailing on the veil. 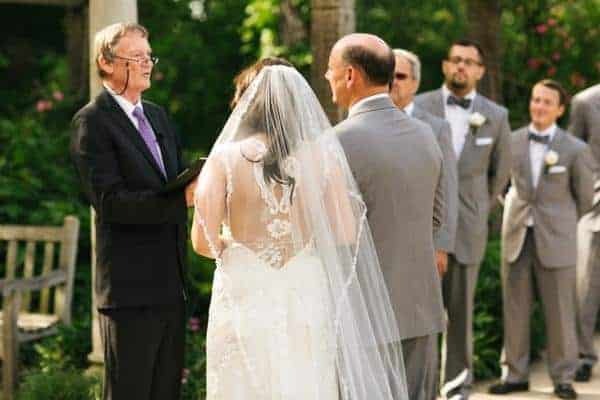 The veil doesn’t take away from the dress, rather it enhances the gown and makes it look like they were made for each other. 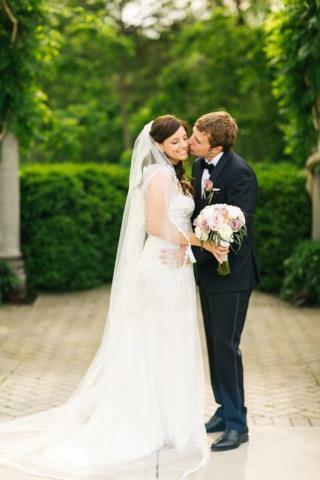 When choosing a lace veil be sure to choose a lace pattern that has similarities. Don’t let the trim lace pattern clash with your dress. 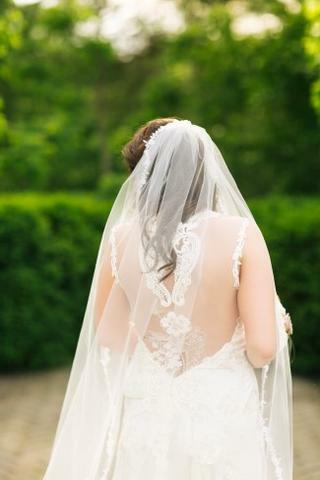 The lace veil was a lovely addition to complete Kelly’s bridal look. We love her intricately detailed lace sheath gown with illusion straps, low ‘V’ back, and a train. 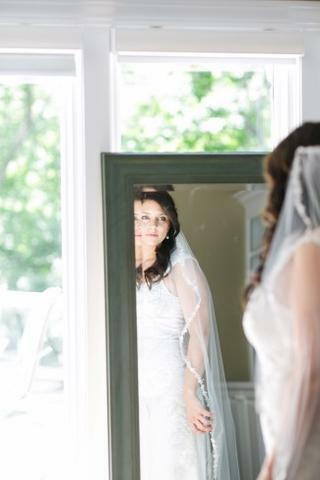 Kelly opted for a 72″ width veil for her big day. The train on her gown wasn’t too wide and she didn’t want too much tulle of the veil blocking the beautiful back detailing on the gown. 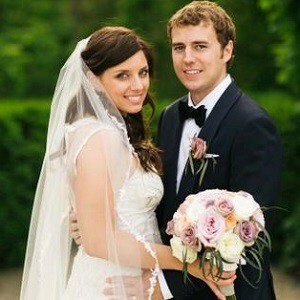 I can’t think of a more stunning chapel length veil than the one Kelly wore. Most bride’s would agree that walking down the aisle in a chapel length veil screams beautiful bride! 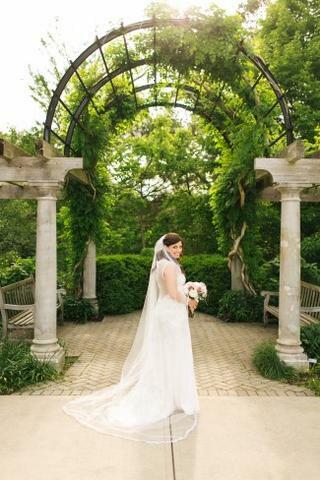 Also known as a sweep veil or full veil, the chapel length veil measures between 90″ and 108″ in length. This veil is perfect for a more formal setting with elaborate gown, and adds a soft illusion to your dress. 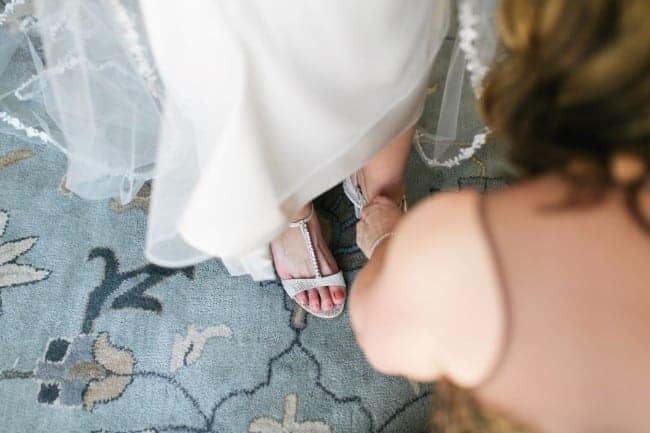 Important: When choosing to wear a chapel length veil be sure to measure where the veil will be placed in your hair and then all the way to the end of your gowns hem. The veil should fall between 6 to 12 inches past your train or hem. 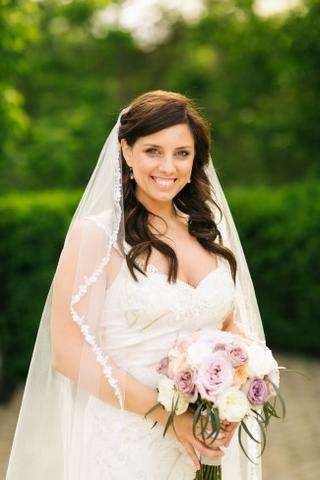 This way your veil will be the perfect length, as pictured below. 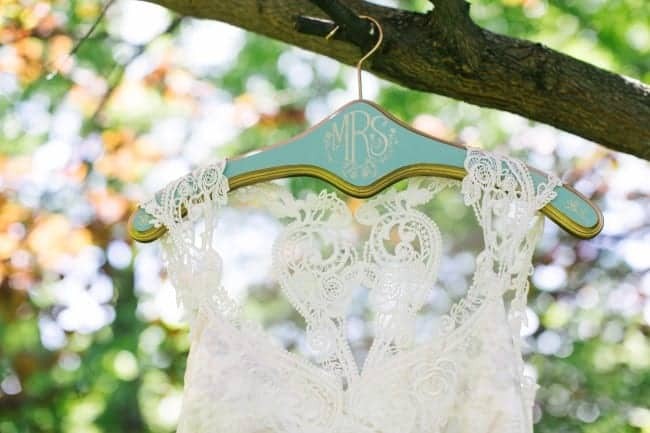 Looking for more lace veil inspiration? Check out the latest article on 7 Unique Lace Wedding Veils.